Today's world is crowded with international laws and institutions that govern the global economy. This post-World War II accumulation of hard multilateral and soft plurilateral institutions by no means constitutes a comprehensive, coherent and effective system of global economic governance. As intensifying globalization thrusts many longstanding domestic issues onto the international stage, there is a growing need to create at the global level the more comprehensive, coherent and effective governance system that citizens have long taken for granted at home. This book offers the first comprehensive look at this critical question of international relations. It examines how, and how well, the multilateral organizations and the G8 are dealing with the central challenges facing the contemporary international community, how they have worked well and poorly together, and how they can work together more effectively to provide badly needed public goods. 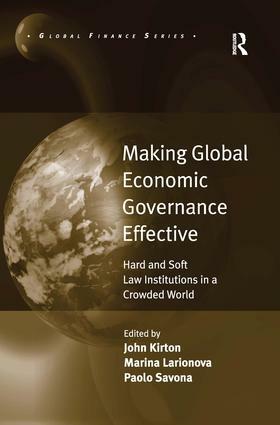 It is an ideal reference guide for anyone interested in institutions of global governance. John J Kirton, University of Toronto, Canada, Marina Larionova, State University-Higher School of Economics, Moscow and Paolo Savona, University of Rome Guglielmo Marconi, Italy.